HiFi-M8 redefines the portable DAC/Amp. This innovative, category-defining product sets a standard others will be judged by. We’ve done that before with our award-winning MicPort Pro and DACport. We did it again with HiFi-M8. A unique combination of sound quality, output power and battery life, HiFi-M8 sets you free to explore your world, audiophile sound in the pocket. HiFi-M8 (pronounced “Mate”) creates a perfect listening experience anywhere you are — at work, on a train, or in the gym; helping you through the workday or soothing you at home. Take your high-res music with you. That’s freedom. HiFi-M8 is a highly flexible product with two input options (M8 and M8 LX). If you don’t use an iPhone, pick the LX, which replaces iDevice input with an optical TOSLINK (SPDIF) input — perfect for people who use a DAP, such as AK-100. The four output options (4XL, RSA, CMB, PRO) offer a broad selection of jacks, ensuring compatibility with a wide variety of headphones. Two input options by four output options makes eight different models! That’s flexibility. Made in USA. HiFi-M8 is designed and precision-assembled by skilled craftsmen in America. CEntrance takes pride in the quality of its products. We test every unit before it goes out the door, so you get a great experience. Built tough. Lightweight and durable, the extruded aluminum body is styled to please. The curves are smooth on the hand and easy on the eye. Super looks and scratch resistance are given by the laser-engraved anodized finish. Portable. HiFi-M8 packs a powerful Lithium-Polymer rechargeable battery for the highest amount of power density. That means longer play time between charges. Battery status is conveniently displayed on an LED bargraph. Versatile. HiFi-M8 is a portable DAC/Amp with iPhone/iPad/iPod and USB inputs. This device does it all! Use your HiFi-M8 with your computer at work and with your iPhone on the way home. Audiophile. HiFi-M8 supports most headphones on the market. High output level means you never run out of loudness. The built-in gain, impedance and tone-shaping switches allow for dialing the sound just right. Dual Core. HiFi-M8 uses a dual-core XMOS microprocessor to achieve the dual functionality of a USB DAC and an iPhone Dock. 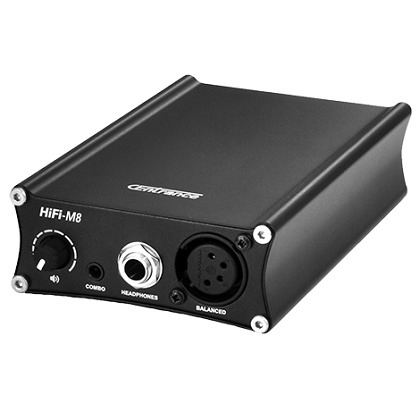 HiFi-M8 runs custom CEntrance code, supporting 24-bit/192kHz, asynchronous USB audio. Driver Support. HiFi-M8 supports up to 24-bit/192kHz resolution with Macs and PCs. With Macs, no drivers are required. For Windows, CEntrance offers a free download of its world-renowned Unversal Driver. Worldwide Use. HiFi-M8 is designed for real-world use. The bundled power supply works around the globe and charges both HiFi-M8 and the attached Apple device. HiFi-M8 can also be charged from a car or a boat.